The origins of Rapidé started in 1997 via a joint venture with Midas International. Midas is the largest auto service center chain in the world made up of over 2,700 shops worldwide. Rapidé guarantees our customer’s peace of mind since our systems, procedures and training programs are all based on the systems and procedures used by Midas Europe and Midas USA. However, in order to fit into the local Filipino culture and consumer, Rapidé has revised and improved the MIDAS programs. 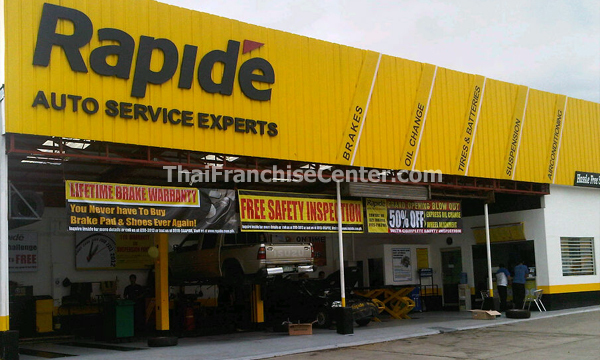 Rapidé has developed what is undoubtedly the most successful auto service center chain in the Philippines. The Philippine automotive marketplace rapidly evolving, Rapidé’s concepts of a “Hassle Free Service” assure our customers of high quality products and excellent service. Traditional core services for maintenance including change oil, wiper blades, radiator flushing and everything to keep any car running at its best. Brakes with complete 45-point brake inspection. Steering and suspension with alignment and balancing utilizing quality aftermarket and imported replacement parts. Clutch and drivetrain for the power needed to transport people. Battery and tire services plus a whole line of other vehicle related services. At Rapidé, we can keep your vehicle running at its best all the time.